Since the time peace process was being implemented under multi-party democracy system, Our Three Main National Causes, which is an actual requirement of the State, and the two points for the integration into the multi-party democracy system were offered. The offer was agreed and accepted by the armed ethnic groups. NCA was signed only after the government, the Tatmadaw and the armed ethnic groups held talks for many times. 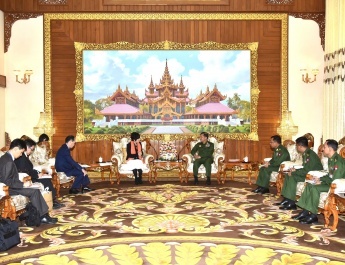 So peace processes should go through the NCA route, said Commander-in-Chief of Defence Services Senior General Min Aung Hlaing at his meeting with Special Envoy for East Asia H.E. Mr. Sun Guoxiang of the Ministry of Foreign Affairs of the People’s Republic of China at Bayintnaung Villa, here this morning. As regards the terrorist attacks of Buthidaung/Maungtaw region, the Senior General said there were 39 armed engagements with ARSA extremist Bengali terrorists during the time from 1 am to 5 pm on 25 August 2017. The terrorists attacked an army unit headquarters at South Bazar Village with the strength of 500 attackers. They simultaneously attacked 30 police outposts which had less strength using manpower strength of 100 to 200 for each attack. Those synchronized attacks clearly show that they were wellprepared. During the incident, the terrorists brutally slaughtered police members, Tatmadawmen, government staff and ethnic people with knives, spears and bombs and other lethal weapons, blew up eight bridges and burnt down villages. Such attacks amount to terrorism. They attacked the army unit HQ and police outposts with sticks, blades, spears, jingalis, homemade bombs and guns using male youngsters. But the security forces while combing the area faced human shields made up of women and children in some places. As they dared attacks the security forces who had guns with sticks, blades, spears jingalis with superior manpower, it is assumed that the terrorists were drugged or used drugs. Security forces used minimum manpower and fire power in controlling the situation. H.E. Mr. Sun Guoxiang said China denounced the attacks that happened in Rakhine State and expressed sorrow for Tatmadawmen, police forces and service personnel who lost their lives in the attacks. The Chinese government will totally support internal peace-keeping measures being taken by the Myanmar government and Tatmadaw. It also believes that the Rakhine issue will be solved. As a good friend and neighbour, China will continue close cooperation with Myanmar in its interest. 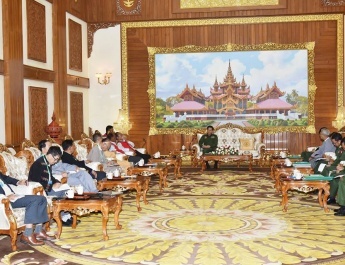 He also discussed cooperative efforts to enlist the strength of ethnic armed organizations in Myanmar’s peace process, the NCA signed by both sides after taking time being the best at the moment though it is not complete and prospects for guaranteeing peace and stability in northern Myanmar. In discussing the peace process, the Senior General said the multiparty democracy demanded by the people needs to be stable. 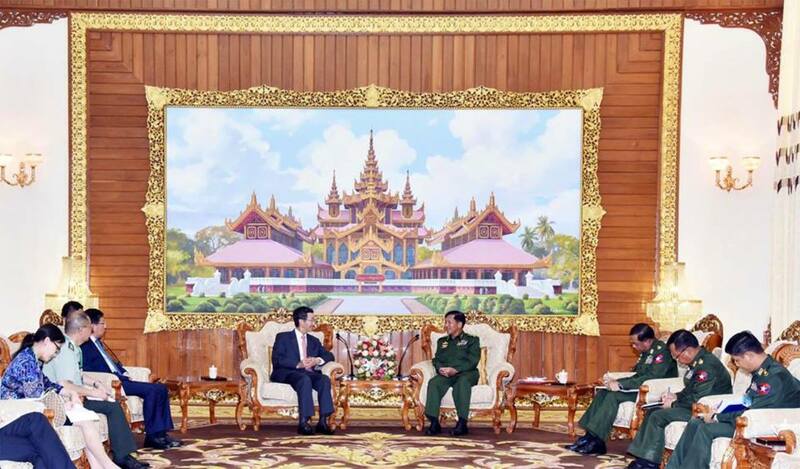 As the Tatmadaw really wants peace, it tried its best to coordinate regarding the NCA. The six peace principles adopted by the Tatmadaw are the prevailing needs for achieving peace. Promise is the most important thing, he said. They then discussed continued peace efforts. Also present at the meeting together with the Senior General were senior military officers of the Office of the Commander-in- Chief (Army). 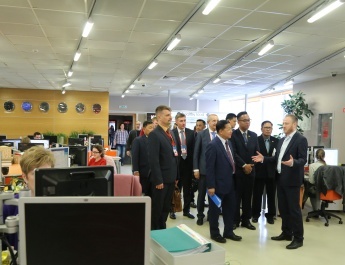 Mr. Sun Guoxiang was accompanied by Chinese Ambassador H.E. Hong Liang, the military attaché and officials. After the meeting, the Senior General and H.E. Mr. Sun Guoxiang had a documentary photo together with those present.